superdumb supervillain: Neighborhood Toy Store Day- Shop Local on Saturday! Neighborhood Toy Store Day- Shop Local on Saturday! I first learned about the American Specialty Toy Retailing Association (ASTRA), a non-profit organization that supports independent toy stores, back in 2009 when we received a fabulous Great Pretenders knight/dragon reversible cape and hood to review. Jasper still dresses up in that set almost daily, which I think is the perfect testament to the value of products selected as ASTRA Best Toys of the Year. They inspire creativity and are made to be kid-friendly and durable, unlike many mass-marketed toys which seem to fall apart right out of the box. 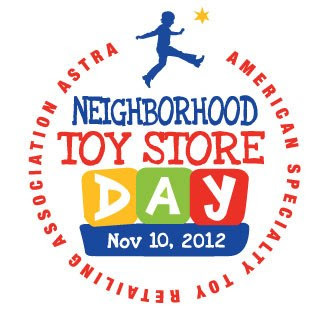 ASTRA's third annual Neighborhood Toy Store Day is coming up this Saturday, November 10th. You can use the handy search tool to find your local independent toyseller. (Ours is about three miles away and it's amazing- we could spend all day in there. And they'd probably even let us!) They most definitely have "The Woo-Hoo Factor:" smart, local and unique. We received two items from the 2012 Best Toys roster to review and both were HUGE hits with our family. 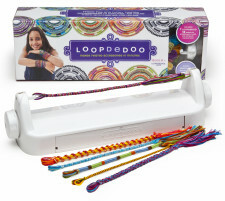 The Loopdedoo spinning tool uses embroidery floss to create wrapped bracelets in any color combination you can dream up. It's a simple machine, using two cranks and hooks and no batteries. It's entirely kid-powered! It does take some manual dexterity so it's best for older kids. Roo is 8 and she needed a little bit of help tying the ends off and making sure it didn't unravel. She made bracelets for everyone! There are tutorial videos online to help instruct you in the more complicated patterns. It's a gift that keeps on giving, especially since the materials (yarn or floss) are so inexpensive. I could see adding handmade clay or shrinky dink charms, or even stamped metal. I may or may not have stolen this machine to keep in my office for future projects. It's pretty darned cool! 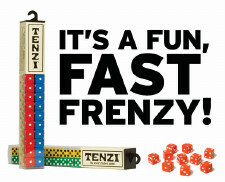 Tenzi, by Carma Games, is a dice game that the whole family can enjoy. 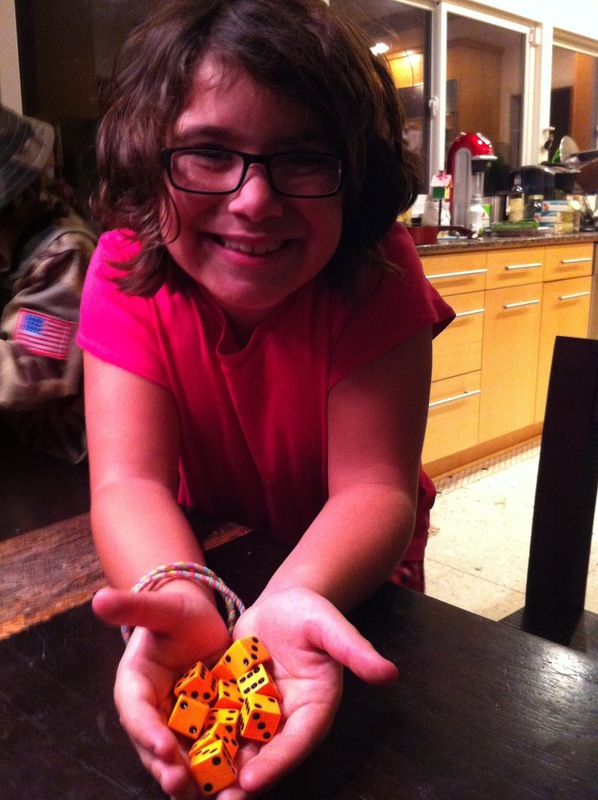 It consists of four sets of ten dice each and the rules are blessedly simple: you keep rolling until you get all ten dice showing one number. Tenzi is suggested for 8+ but Jasper is five and I actually think that it's a good tool to help smaller kids recognize number groups. (Obviously, you'd want to keep it away from toddlers who like to put choking hazards in their mouths!) All of us had a blast with this and it got quite competitive. We haven't gotten past the original Tenzi rules yet but there are many, many variations. I'm actually thinking about picking up another set with different colors so we can have more than four people play at once. There's something very satisfying about hearing all the dice slap down on the table. It's super portable, too, so you could easily slip it into a bag for road trips. Don't forget to shop local at your neighborhood toy store this Saturday, November 10th! 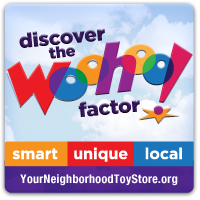 Keep up to date with the best in independent toys by liking The Woohoo Factor on Facebook or follow @TheWoohooFactor on Twitter. You can also search hashtags #toystoreday #localtoystore #shoplocal. In accordance to the FTC Guidelines and the WOMMA Code of Ethics, I am disclosing that I am a member of Child's Play Communications'Team Mom network. We received the toys pictured to facilitate this review. No additional compensation has been provided. As usual, all opinions are my own. There's nothing better than this kind of toy store. They always have the best finds!